Early identification and appropriate engagement of patients experiencing first-episode symptoms of schizophrenia remains a major public health challenge, said John Kane, M.D. 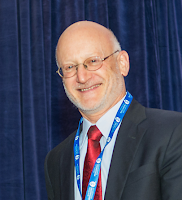 (left), winner of the APA Foundation's 2016 Alexander Gralnick, M.D., Award for Research in Schizophrenia. He received the award on Saturday in Washington, D.C., at APA's fall conference, IPS: The Mental Health Services Conference. During his award lecture, Kane outlined the importance of duration-of-untreated psychosis as a moderator of response to treatment for first-episode psychosis, the impact of nonadherence to medication on the course of psychosis, and the unrealized potential of long-acting injectable (LAI) antipsychotics. Kane said he believes that LAI antipsychotics are an effective but underutilized answer to nonadherence. “I think we have enough data to show that this is a very effective option we are not taking advantage of,” he told meeting attendees. Emerging technologies can also be used to improve treatment adherence, he explained. He and colleagues at Zucker Hillside Hospital and Massachusetts General Hospital have studied the use of an “an ingestible event marker”—a pill embedded with a tiny sensing device that emits a signal when it comes into contact with gastric contents after being swallowed; the signal is picked up by a receiver in a patch worn by the patient, which in turns transmits the signal to caregivers and clinicians indicating that the medication has been ingested. “New technologies, such as smartphones and other monitoring tools, should be systematically developed, tested, and applied,” Kane said. Kane also addressed how pharmacogenetics can help individualize treatment, the importance of managing metabolic symptoms in patients treated with second-generation antipsychotics, the unique value of clozapine for refractory schizophrenia, and the findings from the Recovery After an Initial Schizophrenia Episode (RAISE) project, on which Kane was a principal investigator.